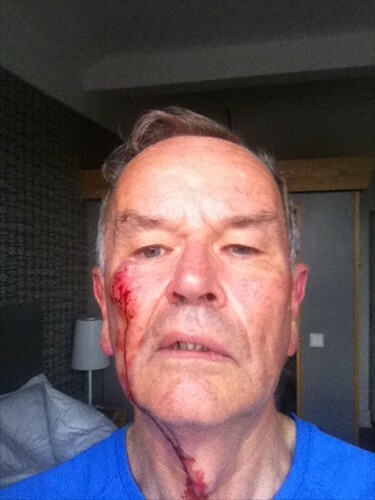 It's over two weeks since I fell over in Glasgow, and I'm still not running. I have finished a course of antibiotics, the leg is less painful, the oedema has abated somewhat. I return to the GP on Tuesday, and hope to be given a clean bill of health, so a return to running may be possible. In search of an alternative (for neither cycling or swimming were permitted) I have been racking my brains to think of some exercise I could take that didn't involve the use of my legs, without success, When I see runners, I feel less the sense of solidarity I used to. Can one go from runner to spectator so quickly? After Tuesday, I'll look at what races remain in the Sussex Grand Prix, and which I could enter. I still want to run six of the GP races over the year, to remain eligible for the Seaford Striders club grand prix, and ideally eight, as the eight best, of which two must be ten miles or more, count towards the GP itself. So far I have done three, the Eastbourne half, the Rye 10 mile and the Worthing 10k. For a much more cheerful view of recovery from injury, see Julia Armstrong's latest post, who knows far more than I do about both running and injuries. Dropsy is a fine Falstaffian word. I enjoyed greatly Simon Russell Beale's Sir John in the BBC's recent production of the history plays. I have a dropsy, oedema of the lower leg, below one of the wounds from Glasgow. This is a damned nuisance. If I were a Falstaffian type I would laugh it off and pour more sack, but I'm a miserable thin person, and there's nothing to do except sit around with my leg up and brood on why, on this great day in British sport, when Bradley Wiggins won the Tour de France and Juneathoner @helsieboo carried the Olympic torch, I could neither run nor swim nor cycle nor sail. It will pass, of course. The antibiotics will start to work soon. I am writing up my notes from the conference on the other blog and they will appear very soon, though I still have to finish my review of the Venerable Bede's new book, his Ecclesiastical History, and record my reactions to the recent Norman invasion. One episode should perhaps be recorded here, for the Bishop-LeFanu lecture was given this year by Yannis Pitsalidis of the World Anti-Doping Agency. In discussing the physiological effects of altitude, he advised all aspiring runners to choose their parents carefully and live at high altitude. More soon. I enjoy running in new locations. Though I've visited Glasgow a few times, I'd never run there, so, as I packed for the Health Libraries Group 2012 conference, I threw in shoes, shorts, t-shirt and Garmin. Conference running is morning running; I've rarely managed it successfully at any other time for after breakfast one is swept up in the hurly-burly. So, for my first morning, I went from my hotel near the station down to the Clyde and east. People on their way to work, dressed for winter rather than summer, queued at bus stops. Glasgow Green had been recommended to me as a place to run in the pub the previous evening, and it was a great, and uniquely Glaswegian place. Here poor mad John McLean would address the crowds at rallies against the First World War, and an old shop steward I knew when I worked as a hospital porter, Jock Curley, told me of the unemployed demonstrations that met here in the 1930s, often attacked by the police. In the centre is the People's Palace, the Doulton fountain and an obleisk commemorating Nelson. The fountain is the largest terracotta fountain in the world, and is impressively imperial: Scottish soldiers, such an important part of empire, guard figures representing Australia, India, Canada and South Africa. On the second morning I resolved to head west. I crossed the river by the piers of an old bridge, inscribed by Ian Hamiton Finlay with a quotation from Plato in both English and Greek, All Greatness Stands Firm in the Storm, or TA ΓAΡ ΔΗ ΜΕΓΑΛΑ ΠΑΝΤΑ ΕΠΙΣΦΑΛΗ ΚΑI ΤΌ ΛΕΓΌΜΕΝΌΝ ΤΑ ΚΑΛΑ ΤΏΙ ΟΝΤΙ ΧΑΛΕΠΑ. From here, I ran along the south bank of the Clyde, at least as far as I could for I came to a housing development who had, illegally, I would imagine, fenced off the path. Making my way inland, I found myself in Govan. I passed a junction at which an average-looking pub is crowned with an impressive Art Deco sculpture. I ran back to the other side of the river over the Clyde Arc. Shortly after this, disaster. I slipped on gravel and fell, injuring knees, hands and my face. I lay on the ground for a while, and then picked myself up and began to walk, painfully, home. A kind and beautiful young lassie out running stopped and asked me if I was all right. I told her I was. Whoever you were, thank you for asking. After limping for a while, I started a slow shuffle and made it back to the hotel, where I assessed the damage. After cleaning myself up, eating breakfast and checking out, apologising to the receptionist for the blood in the room and assuring her I had not been engaged in murder during my stay I headed out for the conference. I paused to buy a newspaper. The newsagent looked at my bloody hands and asked me how I had hurt myself. 'Running', I replied. 'Oh aye', he said, 'we saw a bloody man running past a couple of hours ago'. 'That was me', I confessed. I was a little proud to have offered a remarkable spectacle to the citizens of a city that prides itself on its toughness. I have not run since. I missed the Phoenix 10k. While the black eye subsided, the wound on my left knee is infected and I contrived to fall over again yesterday. 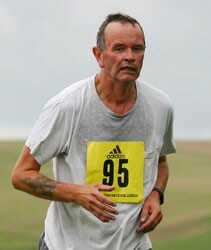 I am now on antibiotics and somewhat anxious to see if I shall be fit for the Bexhill 5k next Wednesday evening. Yesterday I was delighted to meet the cream of Juneathon: JogBlog herself, Helsieboo and KnittingPenguin, and some young men they had in tow. They plied me with wine and flapjack, and I wish I could have stayed longer. 'Clytemnestra gazed up into Tarquin's proud lustful eyes. "Would you like to come and see my race medals? ", he said. It was an order, not a question. She felt weak, and weaker still as her eyes were drawn to his running shorts, whose fabric strained to contain his swelling manhood. "Take off your Mizunos", he mumbled huskily…. [to be continued]. Consummatum est. Juneathon is over, and I achieved my target of a hundred miles, reaching the total with six miles early on Saturday. The longest and hardest run of the month was the Seaford Half Marathon; the only other race was the Worthing 10k. The most enjoyable was a new route for me, a section of the South Downs Way in West Sussex. I'm not sure that there was a least enjoyable. In spite of the poor summer we've had so far, I can't say that there were any when the weather was really bad. I found wind more of a problem than rain. More statistical analysis will follow.